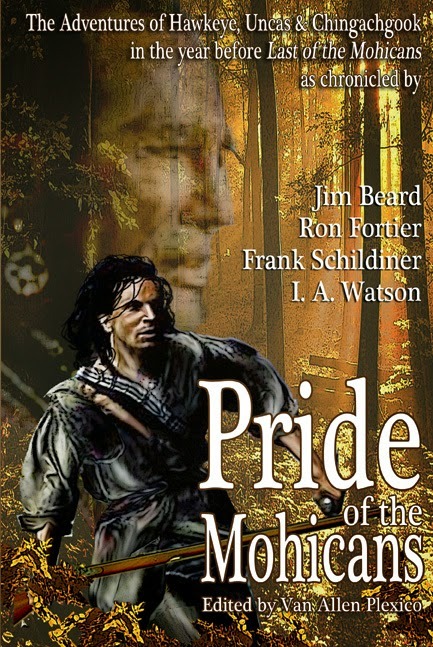 White Rocket Books releases THE PRIDE OF THE MOHICANS. Stories of Hawkeye, Chingachgook and Uncase before the events in LAST OF THE MOHICANS. Stories by Jim Beard, Ron Fortier, Frank Schildiner & I.A. Watson. Features a cover by Laura Givens. 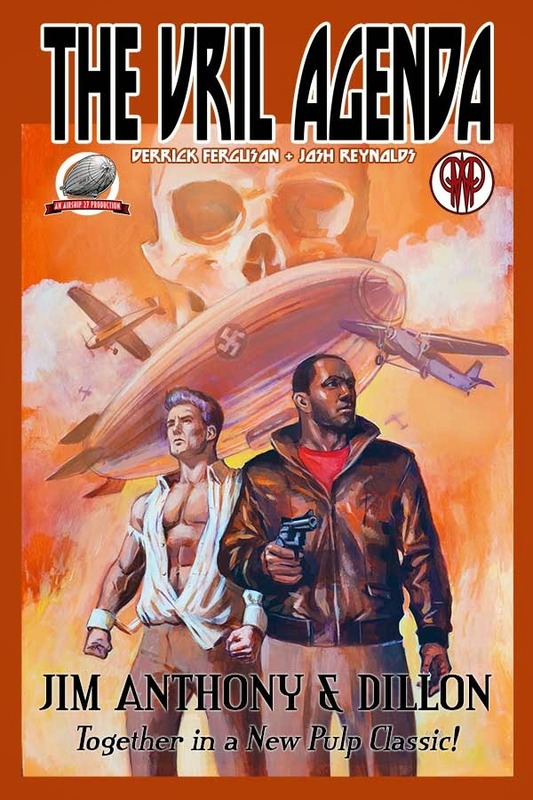 Airship 27 Productions & Pulp Work Press join forces for the very first time to announce the release of THE VRIL AGENDA, a fantastic, action packed pulp adventure by two of the finest writers in the New Pulp field, Joshua Reynolds and Derrick Ferguson. Upon completing his training with the Warmasters of Shamballah, Dillon journeys back to America to begin the next phase of his training under tutelage of one of the greatest adventurers of all time, Jim Anthony – The Super Detective. But no sooner do they meet then one of Anthony’s most dangerous villains resurface from his past to once again threaten mankind, the superhuman Sun Koh – Prince of Atlantis. Now the old warrior and his young student, aided by Anthony’s loyal family and allies, will take on this new threat, pitting their lives against powerful adversaries. From New York to Berlin and then on to a hidden civilization at the bottom of the world, the Super Detective and his two-fisted protégé must stop the fiendish Sun Koh before he can unlock the ages old secret of the Vril power. The book features interior illustrations by award winning artist Rob Davis, with a stunning, dynamic cover painting by Adam Shaw; his first work for Airship 27 Productions. 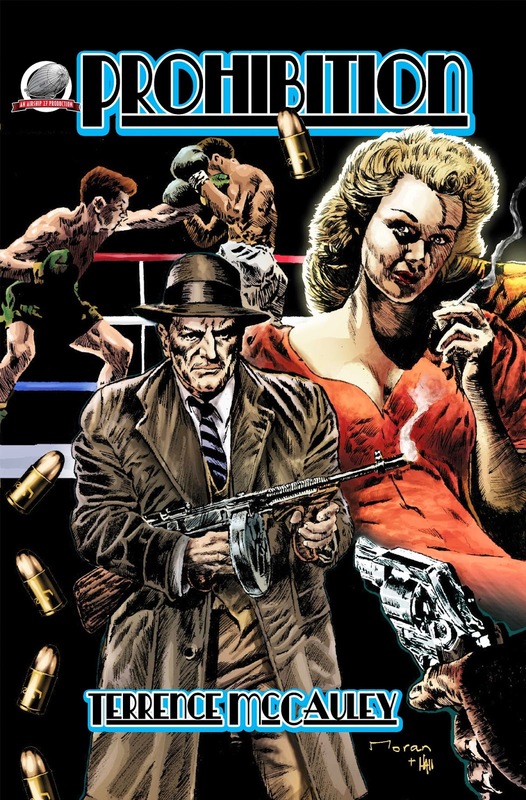 Writers Josh Reynold and Derrick Ferguson have whipped up a frenetically paced tale that never lets up for second, masterfully delivering old fashion pulp action in what is sure to become a New Pulp Classic! AN AIRSHIP 27 PRODUCTIONS - PULP WORK PRESS EVENT! LAST CALL FOR PROHIBITION! We've just received great news that writer Terrence McCauley is about to sign with a major New York publisher who will be doing all brand new editions of his prize winning novels. We couldn't be happier for him. Effectively on Tuesday 15 April, we will be removing the title from our catalog and no longer selling it anywhere; at Amazon or our website. Meaning pulp fans, you've five days left to pick up what is sure to become an Airship 27 Highly limited and collectible edition of this wonderful novel by this up and coming author. 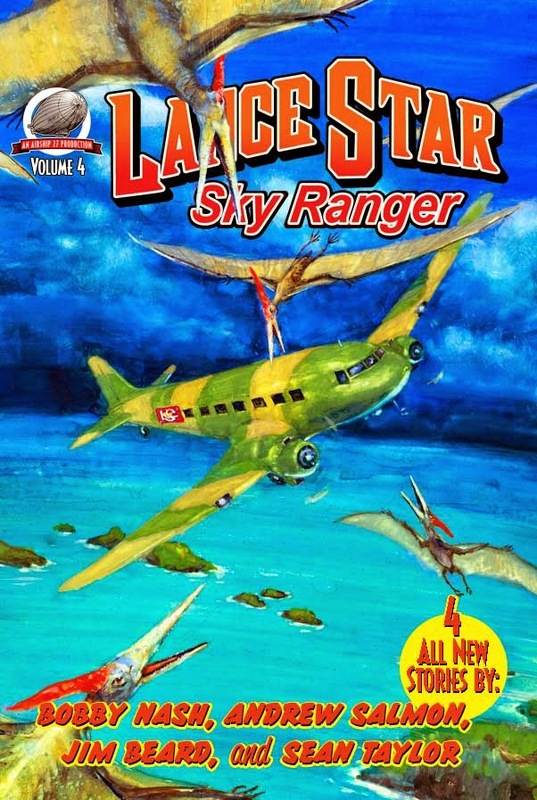 The Lance Star – Sky Ranger series follows in the grand tradition of popular pulp favorites and Dusty Ayers, Bill Barnes, G-8 & His Flying Aces and dozens of other winged warriors of the clouds. Available now at Amazon.com & soon on Kindle. 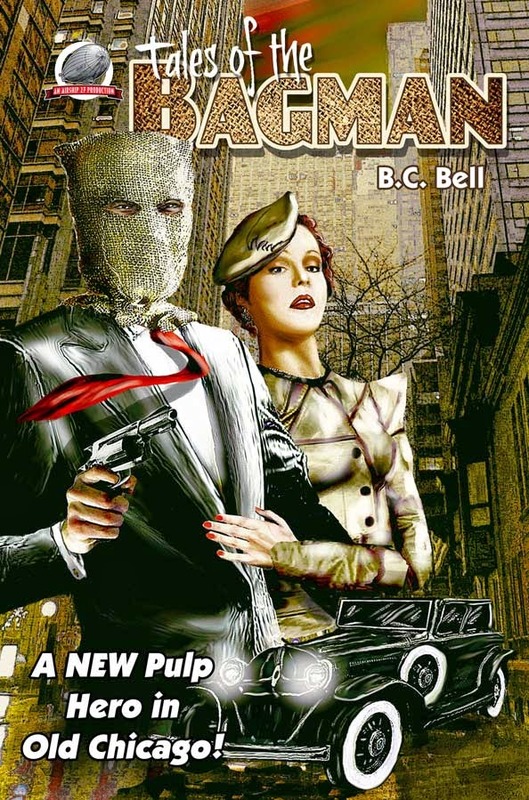 Long out of print, the new Airship 27 Production of Chris Bell's original TALES OF THE BAGMAN is now in print and available at Amazon, with the Kindle soon to follow. THE RETURN OF CAPTAIN ACTION! AIRSHIP 27 LIFTS-OFF WITH CAPTAIN ACTION SEQUEL! 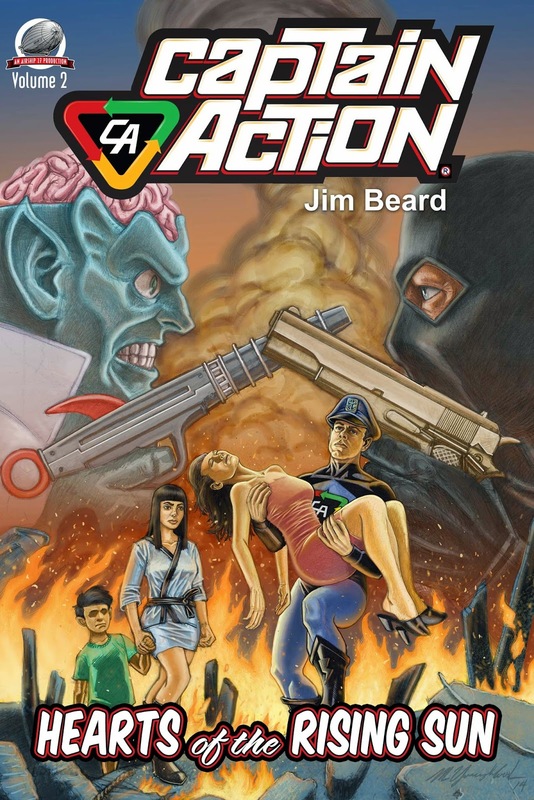 Airship 27 Productions, in partnership with Captain Action Enterprises, is thrilled to announce the release of its second Captain Action pulp novel, “Hearts of the Rising Sun” by Jim Beard. While on assignment in Japan, Captain Action is haunted by the woman he loved and lost years ago in the underground kingdom beneath Siberia. When she mysteriously begins reappearing during his clandestine mission to witness a newly discovered power source, agent Miles Drake begins to question his own sanity. Forces are at work to steal two naturally formed energy stones whose limitless power in the wrong hands could destroy the world. When he begins to suspect his alien nemesis, Dr. Evil, is behind these attacks, Drake has to utilize his most daring disguises ever to learn the truth and ally himself with an old vigilante hero from the past. Now the one and only Captain Action must walk a delicate tightrope between old and new allies while attempting to discover the source of the threat to the Hearts of the Rising Sun. If he fails, mankind is doomed! The book features a beautifully painted cover by Michael Youngblood with nine black and white interior illustrations by Pulp Factory Award winning artist Rob Davis. The popularity of Captain Action has never been greater with the release of CAPTAIN ACTION – HEARTS OF THE RISING SUN, his appeal to today’s pulp fans continues to grow. Available now at Amazon in both hard copies and on Kindle. As Retropreuners, Captain Action Enterprises, LLC specializes in taking old properties and rejuvenating them for a new generation. Captain Action’s appears in an on-going book series, lithographs, statues, action figures, T-shirts, model kits and more. Additional properties include Captain Action Cat, the Zeroids and Savage Beauty. For additional information, please contact Ed Catto at ed.catto@bonfireagency.com.